Hello serger! top: part 1 can be found here. 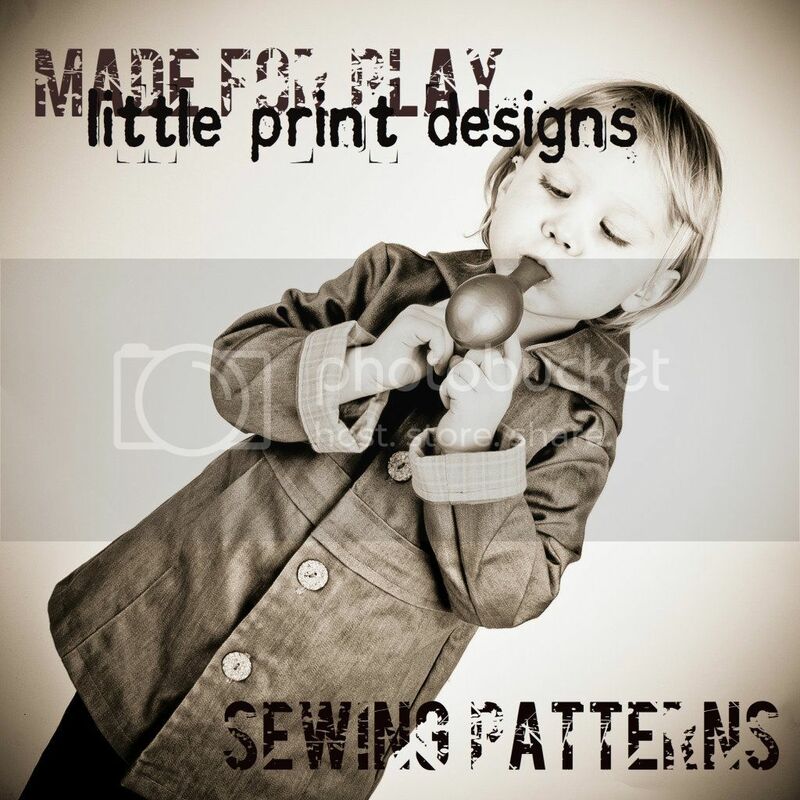 Now that your pattern is all set, it's time to play with the serger. 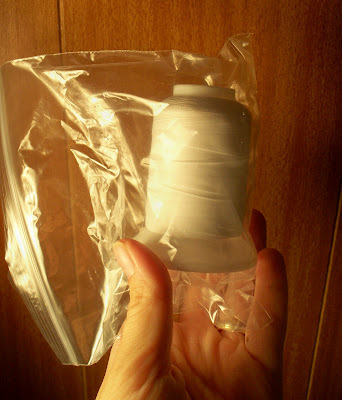 To start, you want to lay your hands on some wooly nylon thread (or another decorative thread: consult packaging for use). We are going to use this for the flatlock embellishments and rolled hem. Wooly nylon is found wherever you find serger thread. Very useful stuff. It basically plumps out your stitches so they cover more space. Nicer, you know? You can get them it in all colours. My favorite one is rainbow, which I use on the kid's clothes often. One thing about wooly nylon is that it has a tendency to dry out. It helps to keep it in a little baggie. To do the flatlocked embellishment, remove the right needle (stick the removed needle into the right needle spool so you do not lose it). Load the wooly nylon into your upper looper. Turn the tension on the left needle to the lowest setting. Turn the tension on the lower looper to the highest setting. 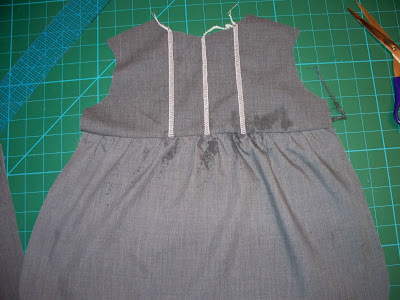 Please please please test this technique on scrap fabric first. You may need to adjust the tension on the upper looper slightly. Generally, the thicker the thread, the higher the tension needs to be. 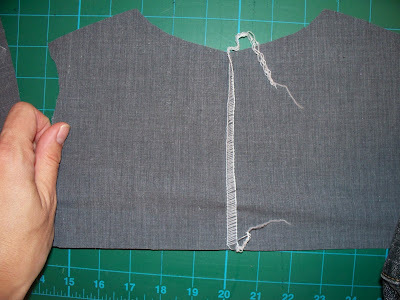 To create flatlocked stitches, fold the bodice in half length-wise with wrong sides together and run it through the serger. (I actually use my iron to flatten the fold to get a straighter line.) 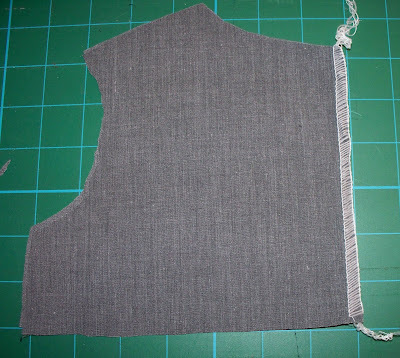 The result should look like this: Then open up the material and gently pull the stitches open until the fabric lays flat: Press on the back side of the fabric with the iron on a low setting. Use tailor's chalk to mark where you want your additional flatlocked embellishments: Flatlock along the chalk marks. 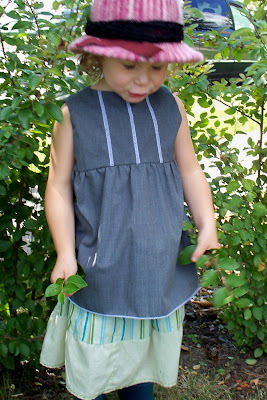 Once the top portion of the shirt is embellished, the gathered bottom portion is attached. 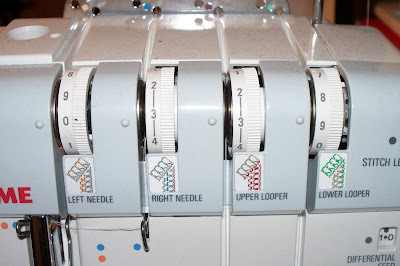 To gather with your serger, use regular thread in all three spools (leave the right needle out). Set the tension on your left needle as high as it will go. Run the top edge of the bottom piece through the machine. The material will gather as you stitch. (Disclaimer: serger gathering works best on lighter material. If you are using a heavy material, it will not gather as well). My gathered material turned out to be a bit too short: So I just pulled on the material to loosen the gathers until it was the right size. 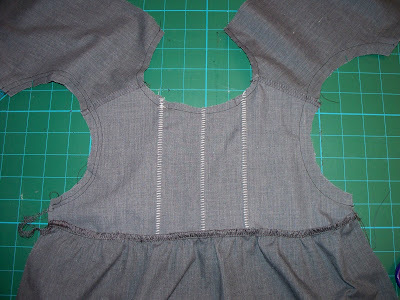 Pin the left edge and right edge to the top bodice piece, right sides together, and evenly distribute the gathers. 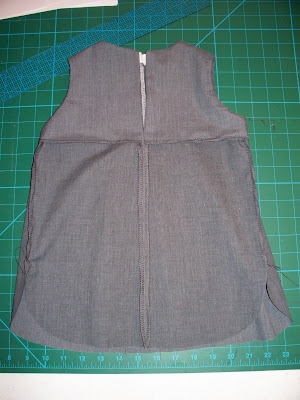 The next step is to attach the back pieces to the front at the shoulders with a regular stitch. 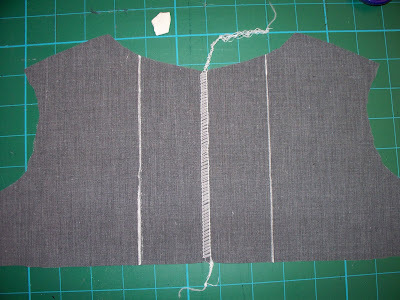 Put the lining together in the same way, with front attached to the back pieces at the shoulders, and then finish the bottom edges of the lining with a regular serger stitch. Turn the top right side out by pulling the back pieces through the shoulders. Press the neck and armholes flat. 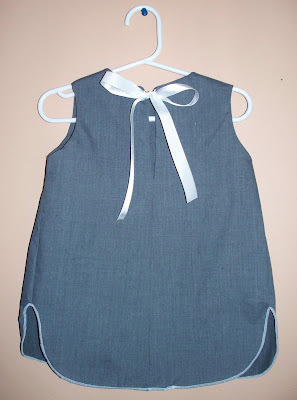 Open up the sides and sew the sides closed. Stich from the lining edge (align the two finished seams) to when the gathered bottom begins to curve away. Turn the back inside out and serge the raw edges of the lining to the shell along each of the sides. 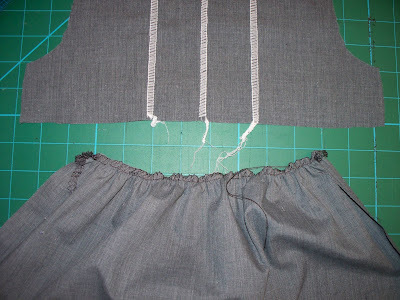 Do not sew both sides together, but do finish the edge all the way down on both sides. Align the two finished edges from the bottom and sew with a regular straight stitch up to a little higher then where the lining begins. Do not stitch the lining. 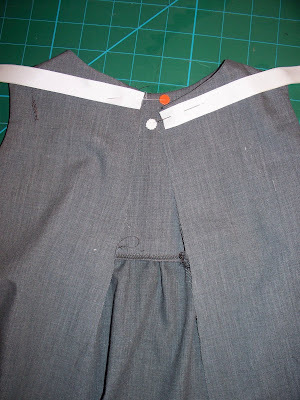 Press the back seam flat. The only thing left to do is finish the bottom of the top. You can load the wooly nylon back into the upper looper, though you can do a nice rolled hem with just regular thread also. Here is the part that you are going to hate me for. If you do not have my type of machine, you are going to have to refer to your instruction manual to find out how to set your machine to a rolled hem. This is because every manufacturer does it different and different models of the same brand even do it different. To add insult to injury, older machines actually require that you change out the presser plate. With newer sergers it is usually a matter of a few adjustments. To find out what they are, though, see your manual. On my machine I actually have three adjustments. I must change my stitch length to the 'R' setting (which means a narrow length). I have to flip the switch from standard tension to rolled hem tension (the arrow on the bottom right). And I have to open up the bottom of the machine to move back another little bit that does something that I don't quite understand but I just memorized which knobs to twist and others to pull back and somehow it works out. Totally clear right? Sorry, you'll have to look at the manual or, even better, go into your local machine dealer and ask them to show you. And then do it there yourself infront of the expert to make sure you can change to a rolled hem setting and then change it back to standard setting. Making sure it is all back to normal after you are done is probably the most important part. 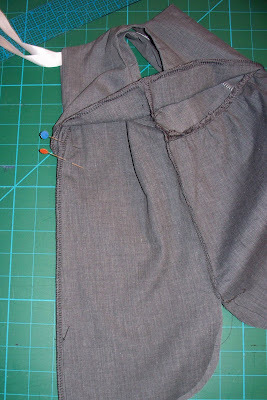 Once adjusted properly, the rolling of the hem is simple - just run it through. To do the curvy bits, make sure that you manipulate the material so it goes under the presser foot as though it were straight. Go slow over seams - they stick a bit if you rush. Flatlocking: Remove right needle. Set left needle tension at lowest. Use wooly nylon, decorative thread or regular thread in upper looper. Set lower looper tension at highest. Stitch with wrong sides together. Gathering (lightweight material): Set left needle tension high. Rolled Hem: consult manual or dealer. Love it. Can't wait to try it. Gotta spend more time with my serger...but it looks so scary! I wanted to comment and say that I just recently found your blog and LOVE your tutorials! I am working on a patchwork skirt for my 4 year old, Ill let you know how it works out. Thanks! 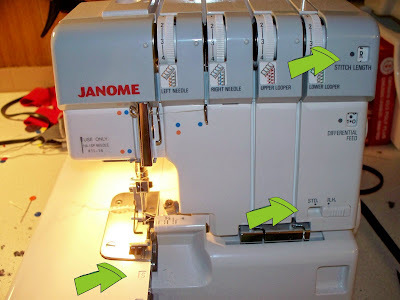 Thank-you so much for posting these serger tips! I've had my serger for almost 2 years now and STILL, I dread using it because I don't "know" it like I do my sewing machine. Thanks again for the inspiration! 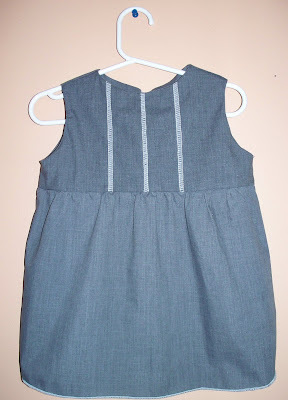 Hi, I bought the Suzanna pattern yesterday (and I also bought a serger yesterday). The pattern is great, everything fits perfectly. 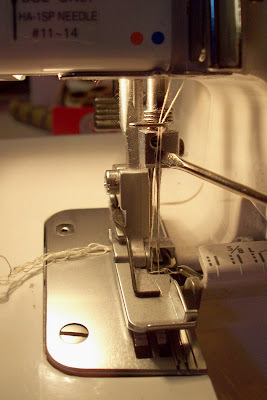 I wanted to know what stitch to use on the serger to join seams. 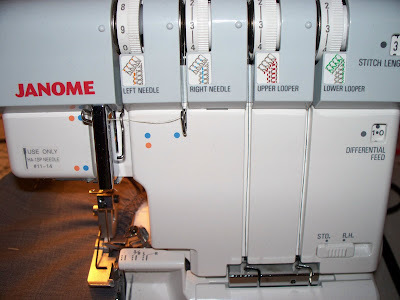 Do you sew seams with a sewing machine and finish with a serger or do you do it all with the serger? When I tried doing it all at once with the serger it seams a little loose. Is it normal? Do you have a picture with a close up of a seam? Thanks. Steph, congrats on the new serger! 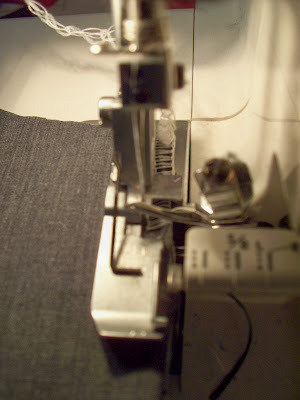 I usually use a regular machine to close the seam and then the serger to finish the edges so they do not fray. I find the same as you, the serger stitches are too loose and show through. You can make your stitches smaller, which helps a bit, but my inner perfectionist refuses to rely solely on serger stitching. Just a regular serger stitch for finishing seams is about right. I can get some close ups on the blog soon, but you should be able to take a gander at the seams of your ready to wear garments and it will give you some good ideas. I'm new to serging and my manual isn't all that helpful, so a big thank you to you!! 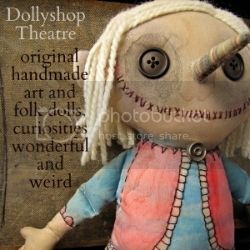 I'm also going to make a technique book...great idea! Love your blog, and will be returning frequently.